Lunch With Leaders is a mid-day event for learning from esteemed members of the community, making connections, and a meal. Join us for a fantastic lunch, great networking, and remarks from community leaders. 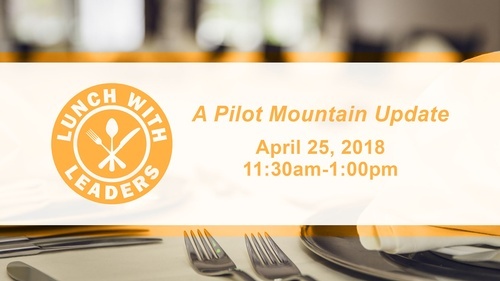 This session of Lunch With Leaders focuses on the past, present, and future of Pilot Mountain. Flounder, Baked & Fried Chicken, Mashed Potatoes & Gravy, Green Beans, Corn, Collard Greens, Peach Cobbler, Strawberry Shortcake, and Salad Bar. Contact Travis Frye, Program & Events Director, if you have questions about Lunch With Leaders. We will be meeting in the private dining room located on lower level.